Simple to Fit – Ring softens when immersed in warm water to aid fitting in a figure of eight configuration. 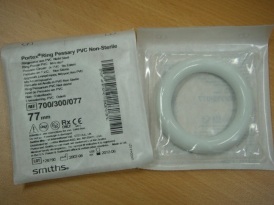 Easy to Maintain – Remove and check ring, cervix and vaginal cavity after 3 months, Wash ring in soapy water before re-insertion according to instructions to use and Replace with a new ring after six months. Sizes available: 50, 53, 56, 59, 62, 65, 68, 71, 74, 77, 80, 85, 90, 95, 100, 110. To order, please specify size ie for size 50, order code is WL-700/300/050.